Creative product designs inspired by the world’s favorite Japanese cuisine. 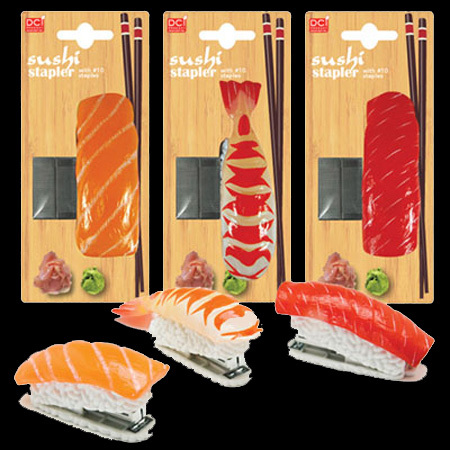 Sushi mini staplers are available in tuna, salmon and shrimp. 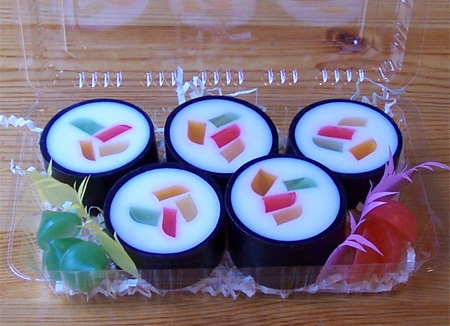 So authentic looking… and while you can’t eat this sushi, it will definitely keep you clean. 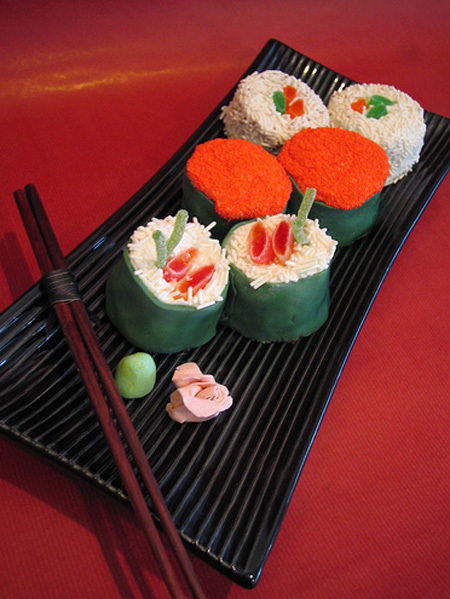 Made of upholstery foam – costume body, rice and sushi contents. 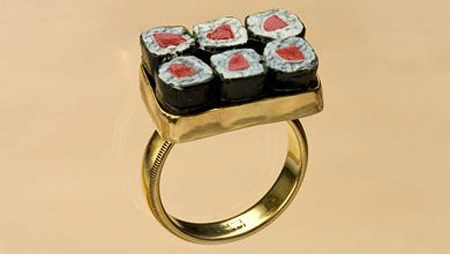 Creative jewelry by Carolyn Tille features realistic pieces of sushi. 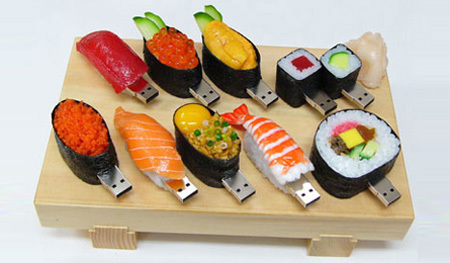 Battery operated, each piece is handmade and arranged in an actual sushi tray. 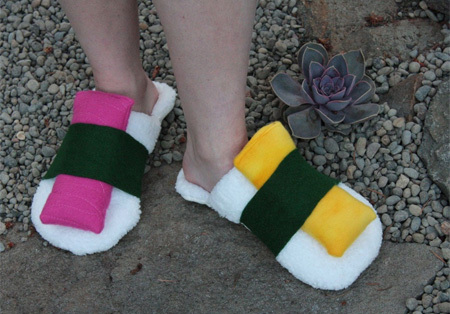 Handmade sushi slippers make a cool gift for anyone who loves sushi. Fondant covered cupcakes with gumpaste “wasabi” and “ginger”. 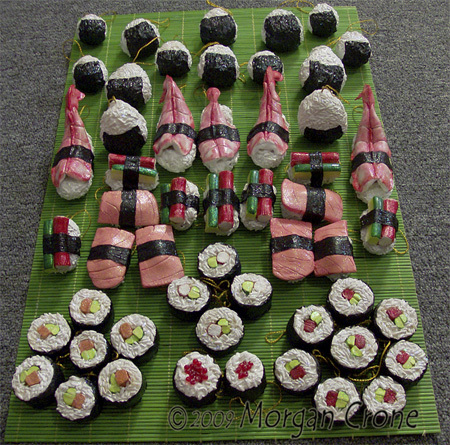 This Sushi inspired set of candles comes with four pieces of sushi plus a side of wasabi and pickled ginger. 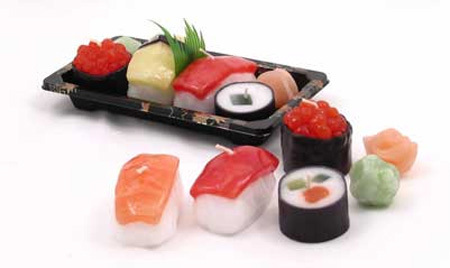 Every piece of each sushi is fully three-dimensional and individually hand sculpted and painted by Morgan Crone. 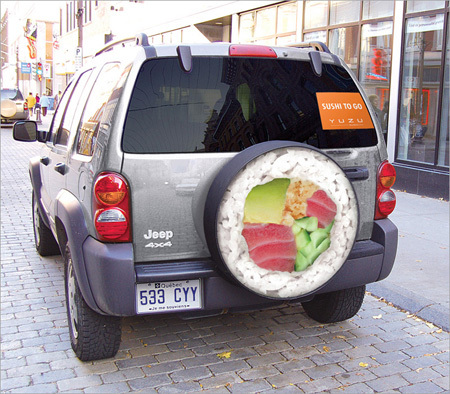 Clever advertisement for Yuzu Sushi by Lg2, Quebec, Canada. 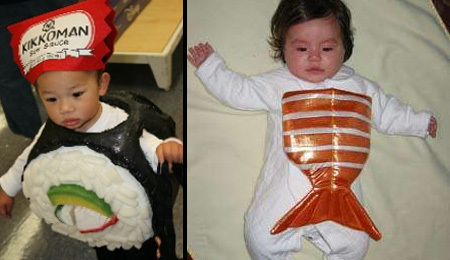 The baby costumes are hilarious, you just want to eat them up!! HAHA I made a funny…. ahhah…. Sushi just inspired the world! Well, those food stylists are at it again. Cute, Creative, and fun! This makes me miss Hawaii. Hard to find good sushi in NC. Eating sashimi here is really not an option. Totally want those pillows. Would look great in our living room. Oh and the clock looks too cool too! eat to live, but how? Last picture… facial expression = Oh my god!